The game of golf has gone relatively unchanged for centuries. Of course, new designs in clubs and courses have made the game more modern and increasingly popular. However, the game has always involved a lot of walking and a keen eye for geography and distance. If you weren’t lucky enough to have the course map memorized, you’d have to rely on a handful of books, guides, and maps. Thankfully, new technology has eradicated the need to lug around anything at all… except for the clubs. 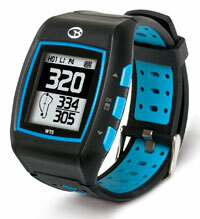 GPS golf watches are a new way to keep track of where you are in the golf course. These watches are a relatively new piece of technology, picking up steam and popularity in only a couple of years time. Just a few years ago, golfers needed to keep a large GPS device at hand that had pre-downloaded course maps. Today, these stylish watches keep all of that information on your wrist. Golfers can just glance down and be greeted with a well of information. Some of the most important pieces of information these watches provide is about the course. Essentially, these watches are field measurement devices. They’ll give you accurate distances and measurements, allowing you to plan your next shot accordingly. They can even keep track of your score, ensuring that you always know where you stand in a game. 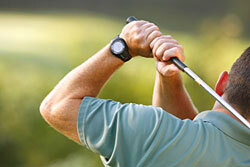 There is a range of different GPS golf watches available, each differing in style and features. Many offer advanced features that help golfers improve their play while streamlining the game and avoiding wasted time on figuring out course information. Here are some of the best GPS golf watches of 2017. From the trusted GPS manufacturer comes the Approach S6. This stylish watch has a high-resolution touch screen display that allows golfers to see the entire course layout, drag and drop pins, and much more. When it comes to maps, this watch has 38,000 international courses included at no charge with free updates for life. It allows golfers to view the course in multiple different ways based on their preference and provides accurate measurements that can be manipulated and saved. In addition to course information, it features score keeping software and smartphone notifications to stay connected on the green. One of the most beneficial features is its swing metrics. The watch measures a variety of factors during a swing and provides helpful tips to train and improve. 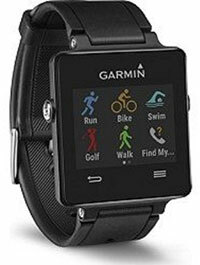 This GPS watch from Garmin is in the same line as the S6, but is a much more affordable option. 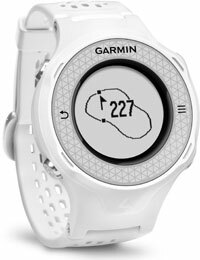 The Approach S4 has a black and white high-resolution touch screen display that can map out the course. It provides precise measurements to the front, back, and middle of the green. It also provides layup and dogleg distances. While the watch has a responsive touch screen, it also features a dedicated “Green View” button that brings up the map up at a simple press. Throughout the game, the watch will track statistics, allowing you to analyze the information and improve. When you’re not on the green, the watch acts as a smartwatch that provides notifications from your phone. 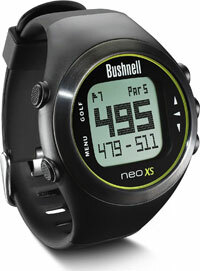 This GPS golf watch from Bushnell has a number of great features and is incredibly easy to use. In fact, the watch can be used immediately. It recognizes the course you are in from its library of over 33,000 international courses. It also has auto advance, allowing you to continue with your game without having to change settings. The high-contrast screen is easy to read and navigate. 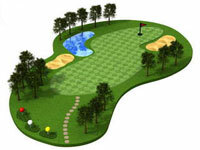 It provides information about the course, hole, and par. It also provides distance measurements front, back, and center of the green. The watch also contains hazard and layup information for each hole. In addition to its game features, the watch acts as an odometer and regular watch that can last up to 2 years without a recharge. If you plan on using the GPS golf features more frequently, it comes with a simple USB charger to get more juice. The Vivoactive from Garmin isn’t just a dedicated GPS golf watch, but rather a multipurpose sports watch. The golf features included in the watch include downloaded maps from over 38,000 courses. It keeps track of the hole, par, and score. It can measure distances to the front, back, and center of the green as well as layups and doglegs. It can also measure the distance of your shot. 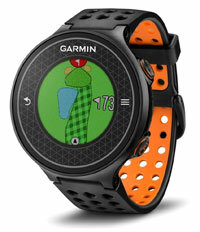 In addition to golf, the watch has applications for running, biking, and swimming. It’s essentially a fitness tracker that can measure your heart rate, distance, sleep, and much more. It has a bright and crisp touch screen display, a battery that lasts up to 3 weeks without GPS, and great smartphone connectivity. It’s also very rugged and waterproof. This watch is a great option for active guys who do it all. 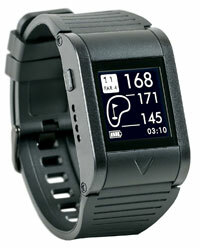 The Golf Buddy WT5 watch is an affordable option that provides a number of great features. The black and white screen is easy to navigate. The 4 buttons are pretty self-explanatory and easy to operate. It provides distances to the front, back, and center of the green. It also helps map out up to 11 hazards per hole, measures shot distance, and automatically recognizes the course you’re on. The main golf page provides the center, back, and front measurements, hole number, par, and if you are to the left or right of the hole. 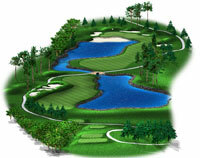 It also shows a graphic of what the course looks like. All of this information makes it simple to use. Golfers won’t have to fiddle with settings, allowing them to focus on the game at hand. Another selection from Garmin’s Approach line of GPS golf watches, the S3 is a sleek option that has all of the great features you’d expect. It’s a bit simpler in design when compared to other Approach models, but this is what makes the S3 so great. It has a 1 inch black and white touchscreen. The small size makes it great for virtually anyone. The screen can depict images of the green, a variety of distances, stats, and score information. The touchscreen can be used to select and move a specific location so that you can easily get accurate measurements. When it’s not in golf mode, the watch can be used as a stylish digital watch and odometer. The watch itself is very rugged and water resistant. It’s available in either black or white with red accents. 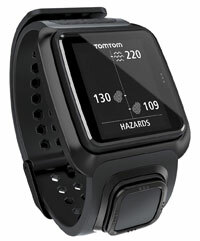 This watch from TomTom has a very modern look. It’s specifically designed with convenience and usability in mind. It uses a large square screen that is visible in virtually any lighting condition. It has a low profile and is scratch and water resistant. The watch provides all of the information you’d need to succeed. This includes green distance, hazards, and layups. The information is presented with unique graphics, allowing golfers to figure out exactly how they’ll approach the green to ensure that they’re effective. It also tracks your score throughout the entire game. Courses are constantly updated on a daily basis. In fact, course notifications are received via Bluetooth from your smartphone. With its modern design, the watch fits in with even the most advanced gear. While it looks like a standard digital watch, this advanced GPS watch provides real-time information throughout an entire game. It can measure front, center, and back distances to the green. This is all displayed on a backlit screen. These distances constantly update as you move throughout the course, providing accurate information at a moment’s notice. There are up to 30,000 courses available, all without fees or a subscription. When you’re not on the green, this watch acts as an odometer to measure your distance, speed, time, and calories as you run or walk. It’s available in black, white, and green, allowing guys to choose a watch that’ll work with their own personal style. With a minimalist and elegant design, the Callaway GPSync golf watch is a great option. The low profile screen is monochromatic with a very high contrast to make reading information easy in any light. It’s preloaded with over 30,000 courses, which are automatically recognized when you’re near them. The distance to the front, back, and center of the green are displayed in full view. Layup and carry distances to hazards and doglegs are also easy to view. Throughout the game, the watch keeps score and uploads the data to your smartphone for easy analysis. It also keeps track of the putts per round and GIR. Its simple black design makes it a great choice for a normal watch when you’re not playing. 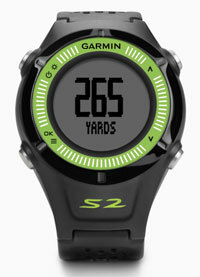 The Approach S2 has very similar features to other options from Garmin. However, it has a few unique features that set it apart. One of it’s biggest features is its accuracy. The GPS is very sensitive. This provides precise measurements, even when you’re under trees. It measures green, layup, and dogleg distances. The scorekeeping features on this watch are also very useful. It measures shot distances and keep tracks of your swings. These scores are stored on the watch and can be printed out at a later time. It comes with over 30,000 international courses that can be updated for free. Style wise, this watch comes in a number of bright colors and has four buttons around the circular screen, making it look like a standard digital watch. With all of the options currently available, it can be a bit overwhelming choosing the right golf GPS watch. To make things easier, guys should narrow down what they’re looking for. There are a few things to consider prior to searching for a watch. Taking these aspects into consideration can make the selection process much easier. Features should be one of the most important things to look for. Watches vary based on what they offer. Some have advanced measuring and tracking features while others simply display distances. Guys should choose based on how they play and what they’ll need. Guys should take into account how comfortable they are with the technology. While many watches are very easy to use straight out of the box, others require fiddling through multiple menus and customization settings. Smartphone compatibility should also be considered, as it can have a huge effect on usability. The number of maps offered and any fees associated with them should be considered. While most watches offer free maps and updates, others require subscription fees. Since it’s something that’ll be worn, the design of the watch is important. Watches come in a variety of styles and colors. Guys should choose based on their personal preference while also taking screen size and visibility into account. Simple changes in how the watch is put together can make a huge difference. Screen size, ruggedness, protection, and battery life should be considered. Generally, these aspects of the watch will also play a role in its cost. 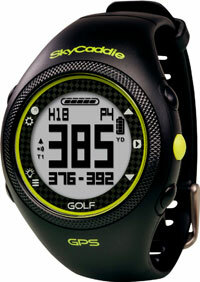 Golf GPS watches can be quite pricey based on the brand and features. Feature-rich options can be a few hundred dollars or more while simpler alternatives are generally more affordable. All in all, golf watches are a great way to take the stress out of course tracking and measurements. The information they provide is quick and accurate, allowing you to strategize and make the most effective shot possible before getting on with the game. With the plethora of watches to choose from on the market today, it’s important to figure out what works with your needs. 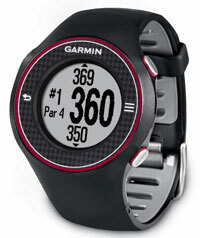 With the right golf GPS watch, guys will have all the information they need to dominate the green.